IBM® WebSphere® Process Server is the next generation business process integration server that has evolved from proven business integration concepts, application server technologies, and the latest open standards. 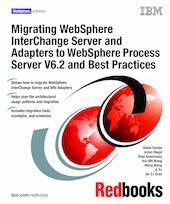 In this IBM Redbooks® publication, we provide guidance for WebSphere InterChange Server users about how to migrate IBM WebSphere InterChange Server and WebSphere Business Integration Adapters to WebSphere Process Server. We discuss the critical concepts that are related to integration solution architecture, migration project planning, and the technical implementation approach. We provide a detailed discussion about the capabilities of the migration tools. In addition, we include various migration examples that show how to upgrade IBM WebSphere InterChange Server and WebSphere Business Integration Adapters to WebSphere Process Server and WebSphere Adapters. - Part 1 introduces the high-level concepts required to comprehend the migration roadmap. - Part 2 discusses relevant migration implementation concepts. - Part 3 covers the standard migration tools to upgrade from WebSphere InterChange Server to WebSphere Process Server. - Part 4 provides comprehensive examples to migrate end-to-end integration solutions.